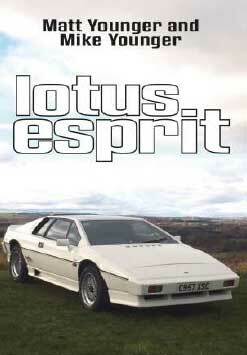 First launched in 1976, the Lotus Esprit was designed by Giorgetto Giugiaro and based on a Lotus Europa chassis. The following year, the car made its debut in the Bond film The Spy Who Loved Me, where, after a car chase, it metamorphosed into a submarine. 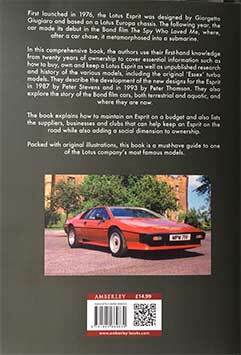 In this comprehensive book, the authors use their first-hand knowledge from twenty years of ownership to cover essential information such as how to buy, own and keep a Lotus Esprit as well as unpublished research and history of the various models, including the original ‘Essex’ turbo models. They describe the development of the new designs for the Esprit in 1987 by Peter Stevens and in 1993 by Peter Thomson. They also explore the full story of the Bond film cars, both terrestrial and aquatic, and where they are now. The book explains how to maintain an Esprit on a budget and also lists the suppliers, businesses and clubs that can help keep an Esprit on the road while also adding a social dimension to ownership. Packed with original illustrations, this book is a must have guide to one of the Lotus company’s most famous models. 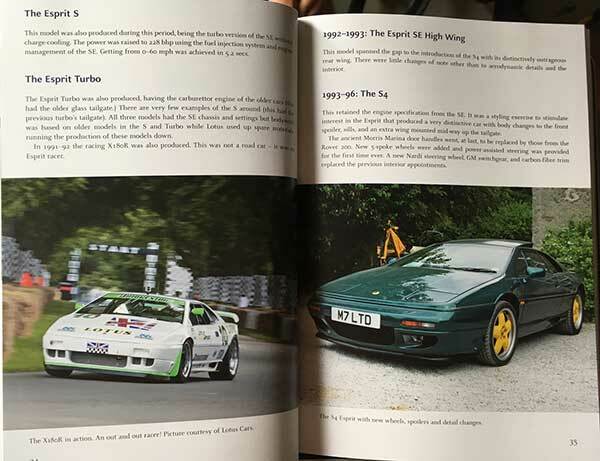 After receiving our copy, we firstly flicked through the 96 page paperback book, checking out the pictures and looking for a Lotus Esprit World mention. Considering we had no input and weren't contacted, it's nice to get a mention on pg81! As for images, there's plenty in the 96 pages, with only a few spreads without a picture, we've including a couple of images of the inside to show you how visual the book is. There's plenty of interesting pictures of the Esprit throughout it's lifetime. 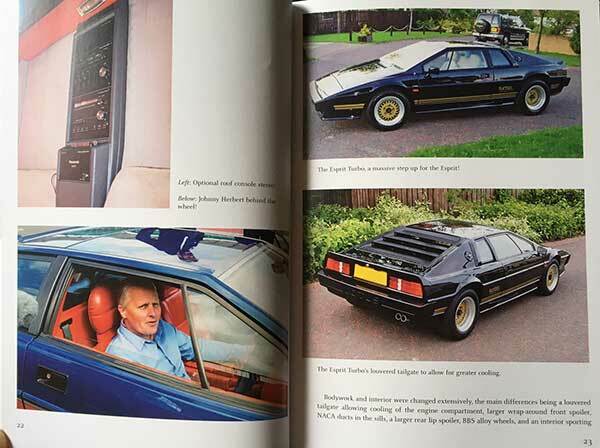 There's a mixture of Official pictures taken by, what we would imagine, professional photographers and by owners, who are credited on pg4 along with Group Lotus and Stuart Monument for his article on the Active Esprit suspension, which finished off the book. All the pictures are very high quality and are printed with an eye to making them stand out, which is ideal, as there's so many pictures! You can talk about the Esprit, but nothing beats seeing one.....or loads of them! So you know what you're getting here's the content of the chapters in the book. Extras – Some Rare Models and James Bond of Course! Now you're probably not visiting this page to hear me babble on about my thoughts on the Esprit, I've been doing it on this site for over 15 years. You're probably more interested in whether it's worth the £14.99 price and should you buy it or not. Well, as an Esprit Nut, with a price under £15 and a lack of recently published books, then YES! We love it....... but you're not me! If this was back in 2001, when I started LEW, due to a complete lack of reliable information on the internet about the Esprit and only one real book to purchase, this would have been a god-send. The content still has real value for any one interested in the Esprit, either an owner, enthusiast or potential buyer. If you're looking to buy, then this isn't going to stop you, it's going to get you even more excited. If you're an owner, you going to appreciate what you have even more. It would be a great present for anyone who owns or wants an Esprit too. Full history of the various Lotus Esprit models. Includes new research on early models, including the Bond film cars. Includes ownership and buying advice based on first-hand knowledge. Also available in Kindle, Kobo and iBook formats. Email p.dean@amberley-books.com for further details. Matt and Mike Younger are brothers who have a long-term passionate interest in Lotus Cars. Mike is a headteacher and Matt is a Sales Manager. Their leisure time is built around ownership and restoration of Lotus models, including many Esprits. Mike has owned some extremely rare and sought after cars, all of which will be documented in the book.